The Old Foodie: A Plethora of Puddings. Well, I did promise a story about the Pudding Club. 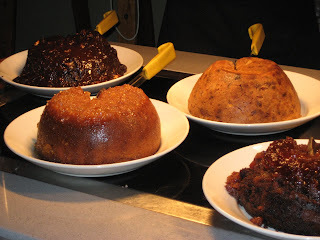 Seven traditional English puddings are served at each Pudding Club dinner. 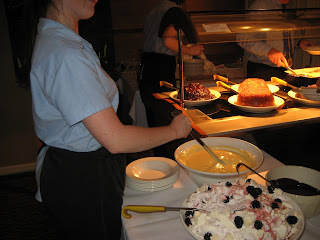 After a small main course, the puddings are carried in in great state, to be admired before they are demolished. The rules are (1) each table can only go up to the pudding counter when called (2) only one pudding at a time (3) you must finish your pudding each time – clean your plate right up!. - Lord Randall’s Pudding (a steamed pudding with apricots and orange, and marmalade – lovely). This is a special recipe of the club. - Eton Mess with blackberries instead of the traditional strawberries. Naturally, the puds are served with lashings of custard (8 gallons per evening), and by popular request over the decades, this is not made from scratch, but is the iconic British Bird’s brand. Accolades and Congratulations for the Club for keeping these puddings alive. Eton Mess is now a traditional part of the Eton Open Day in June, as well as of course, Wimbledon and the Henley Regatta. It seems that originally it may have been made with bananas, and was essentially just a mixture of these (or the strawberries) and cream or ice-cream. At some time (maybe in the 1930’s? ), broken up meringues were mixed with the cream, and this is now the “traditional” recipe. “Recipe” is not quite the right word, it is more of an assembly really. Just take approximately equal amounts of strawberries and cream, and fold them together with the broken up pieces of meringue – and serve immediately. I should be arriving home in Brisbane shortly after this story pops up! The Pudding Club sounds fun, although sadly pudding itself hasn’t caught up much here in Brisbane. 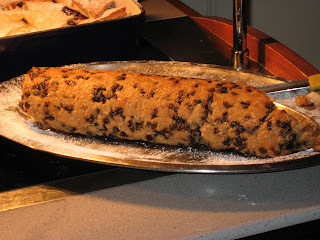 Unlike cakes or breads, pudding is something only our grandmothers will bother to make, usually for Christmas.